Stems: Erect or ascending, single or clustered, usually unbranched, glabrous. Leaves: Alternate, simple, mostly sessile, linear-lanceolate to oblanceolate, 2 to 5 inches long, 1/4 to 1 inch wide, conspicuously 3-nerved, somewhat rigid, glabrous; margins entire to toothed; tips pointed; smaller leaves often clustered in axils; upper leaves reduced; lower leaves often absent at flowering. Inflorescences: Panicle-like, usually wider than tall, terminal; lower branches downward curving; heads only on upper side of branches, less than 1/5 inch wide; bracts firm, greenish; tips broadly rounded. Flowers: Ray florets 7-13, less than 1/5 inch long, yellow; disk florets 8-13, yellow. Fruits: Achenes, tiny, glabrous or sparsely hairy, tipped with numerous white bristles, enclosing small seed. Habitat: Dry open prairies and roadsides. Uses: Native Americans relieved toothaches by chewing goldenrod roots. Comments: The earliest blooming goldenrod. Its roots can reach 6 feet long. 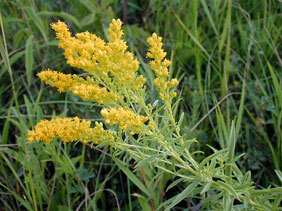 Missouri goldenrod increases in overgrazed pastures.